As a holistic dentist, Dr. Olivia Hart strives to provide the least invasive, most conservative dental treatment possible. She knows this approach reduces anxiety and results in faster recovery. In keeping with this philosophy, Richmond Family Dentistry in Richmond, VA is equipped with a suite of advanced hard and soft tissue laser instrumentation. A laser is a precise machine that concentrates a specific wavelength of light into a concentrated beam. This focused energy allows a trained and experienced dentist to perform intricate procedures without cutting or drilling, and in many cases without numbing. The meticulous nature of laser dentistry avoids destruction of healthy surrounding tissues. 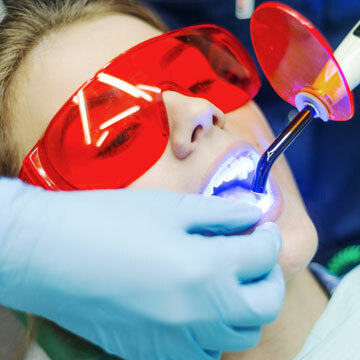 Hard tissue laser dental techniques do not create the sound, vibration, frictional heat, or smell associated with drilling, and that alone alleviates the apprehension of many patients. Soft tissue laser therapies are virtually painless and there is minimal bruising or swelling. Since the laser automatically cauterizes, there is little or no bleeding, no sutures, and the site heals quickly. These gentle treatments are safe for patients of all ages, including children. Dr. Hart offers two additional laser treatments not found at most dental practices. NightLase is a non-surgical solution for snoring. Laser energy is directed to the back of the throat. It creates a thermal response that contracts soft tissues and stimulates internal production of collagen for further tightening. SmoothLase is a similar concept that provides cosmetic enhancement, smoothing facial lines and wrinkles. Treatment is administered to cheek tissues inside the mouth, firming surface skin without surgery or injections. Contact Dr. Olivia Hart of Richmond Family Dentistry if you think your smile could benefit from laser dentistry. Click here to make an appointment now or call (804) 381-6238 to learn more.